The directors of the company are charity trustees for the purpose of charity law and, under the company’s Memorandum and Articles of Association, are also known as Members of the Board. Board Meetings take place approximately every three months. Chris is a Partner and Head of Public Affairs at Kreab Gavin Anderson. He was previously Director of Financial Capability at the Financial Services Authority, and Chief Executive of One Parent Families / Gingerbread. Before then, he was the MP for Gravesham and Parliamentary-Under Secretary of State in the Department for Work and Pensions, Parliamentary Private Secretary in the Treasury as well as a member of the Social Security Advisory Committee. Before entering Parliament, Chris was Director of the Low Pay Unit. He is also Chair for the Standards Board of the Equity Release Council, Trustee of the Family and Childcare Trust and Director of Cape Claims Services Ltd. He is currently chairing a working group on debt for the Centre for Social Justice. He used to chair Capacitybuilders, a funding agency for the Third Sector responsible to the Cabinet Office, and was a senior advisor to HMRC and the European Commission. Stephen has specialised in credit, debt and insolvency work for the bulk of his professional career. Prior to setting up his own consultancy, he occupied senior management positions in law firms, and still undertakes work for Lester Aldridge Solicitors as well as pursuing other projects in the legal, insolvency and credit fields. Stephen has written a standard text on Debt Recovery and was recently involved in the publication of a new text on Personal Insolvency. He has written numerous articles for legal journals and other business magazines and is a popular and sought after lecturer on insolvency and debt-related matters to accountants, solicitors, bankers and credit managers. He acts as a Technical Consultant to both Credit and Insolvency Today magazines and chairs the premier awards scheme for the industry. He was a senior member of ACCA’s disciplinary processes for a number of years and is now one of the Chairmen of the Methodist Church Disciplinary Process as well as being the Deputy Independent Examiner for the Actuarial Profession. In 2013 he was appointed Chairman of the Joint Insolvency Examination Board which oversees the examination and appointment of new Insolvency Practitioners. Much more important than any of the above however, he is a Director of Yeovil Town Football Club; without a doubt the finest football league team in the south-west! Linda is a Partner at KPMG LLP and a pension actuary by training. She has long had an interest in the broader concept of savings and its connection to financial wellbeing. At KPMG Linda has advised a wide range of stakeholders on savings and pensions across sectors including a number of charities. Linda set up and leads KPMG’s UK Business Women’s Network for talented female leaders and in 2014 she co-founded KPMG UK’s C-Suite Leadership Programme. This programme provides a unique development experience for individuals who are close to executive board level for FTSE100/equivalent size organizations, helping develop their understanding of, and leadership capabilities through, accelerated changing, disruption and technology, where individual and organizational agility is key. Linda is on the DWP’s Advisory Board for the 2017 Review of Automatic Pension Enrolment and has contributed to research for the Institute of Actuaries around the need for retirement to not be a single point change. Linda lives in Cambridgeshire with her family and to de-stress, Linda goes running or enjoys a nice glass of red wine. 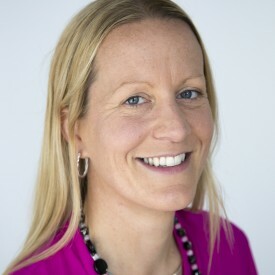 Anne Pieckielon is Director of Product and Strategy at Bacs, the industry body behind the UK’s leading automated payment products, Direct Debit and Bacs Direct Credit, as well as the flagship Current Account Switch Service. Her experience spans the commercial and operational design of products and services through to their cost-effective operation. Much of her time is devoted to managing stakeholder relations ranging from banks and building societies, service users, consumer groups, and Government. Anne is an expert on the UK’s financial market and maintains a high level of awareness when it comes to external environmental forces that could influence and inform decisions relating to the sub-schemes of Bacs and the wider payments industry. This includes political and regulatory changes plus economic and technological developments. Passionate about driving wider representation across the industry, Anne is also the executive lead for gender diversity and inclusion within Bacs, a subsidiary of the New Payment System Operator (NPSO). She champions HM Treasury’s Women in Finance Charter and leads the Emerging Payment Association’s (EPA) Women in PayTech Project.